It's official. I am a beauty box-aholic. Do they have rehab and 12 step programmes for us yet? Here's another box that I have recently subscribed to, but unlike the others, I've joined for completely different reasons. The Amarya box is currently the only beauty box on the market to use only organic and natural products. Since the beauty box craze began, I had been hoping that someone would happily exploit the ever growing market for the more eco and green consumers out there, and was very pleased to finally come across this one. Amarya works like all of the other boxes in that you pay a £10 subscription (no extra for postage yet) for which you receive a monthly box of goodies and you can cancel at any time. They guarantee at least one full size product in each box, along with trial size products and samples, and a 'mystery' special offer, which generally seems to be a good online discount on brands featured in the box. Another good thing about Amarya is that they accept Paypal, which I'm sure the other beauty boxes will follow. The box is bigger than the others, I'd say it's similar in size to the Carmine box and kind of looks like a shoe box. As you can see it's plain white with their logo and inside there's hot pink tissue paper. 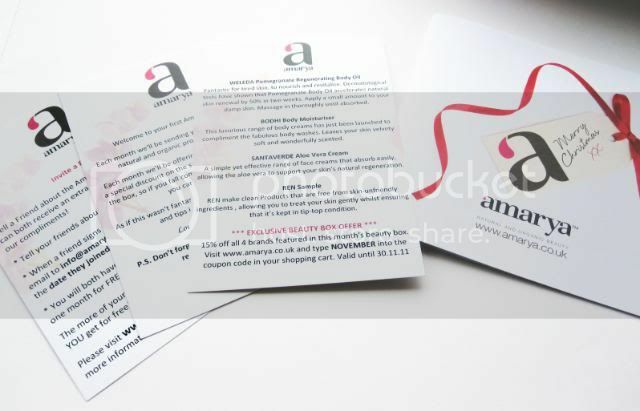 Included are leaflets explaining the box and the products etc, as well as a small Christmas catalogue for Amarya (like Feel Unique, they are an online retailer for various brands, all of which are organic/natural). 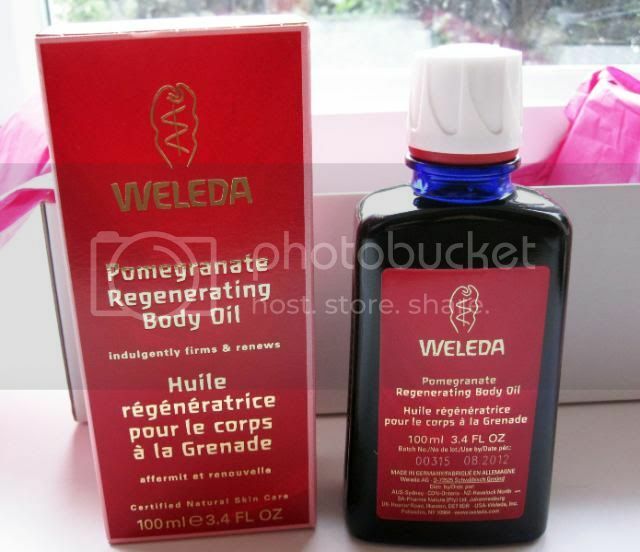 (1) Weleda Pomegranate Regenerating Body Oil, full size (£19.95) - "antioxidant-rich, organic pomegranate seed oil helps to promote skin renewal and improve the firmness of your skin." Subscribers to Glossybox will know all about this one and it really seemed to be a marmite item back then, some people loved it, others hated it. I wasn't subbed to Glossybox at that time, but I did try a bit from a friend's bottle and remembered liking it so I'm happy to receive one for myself to use. (2) Bodhi Jasmine Falls Relaxing Body Moisturiser, travel size 40ml (full size 250ml - £23) - "luxurious body cream that leaves your skin velvety soft and wonderfully scented. Made with natural ingredients and 100% pure essential oils, ethically-sourced from sustainable origins, and made in England." This smells amazing. I use Jasmine a lot in my oil burner to fragrance my room, but I don't think I've ever tried a body moisturiser with it in. Tried a bit on my arm and its a light, non greasy formula that absorbs immediately into the skin. Reminds me a bit of Ahava body creams. 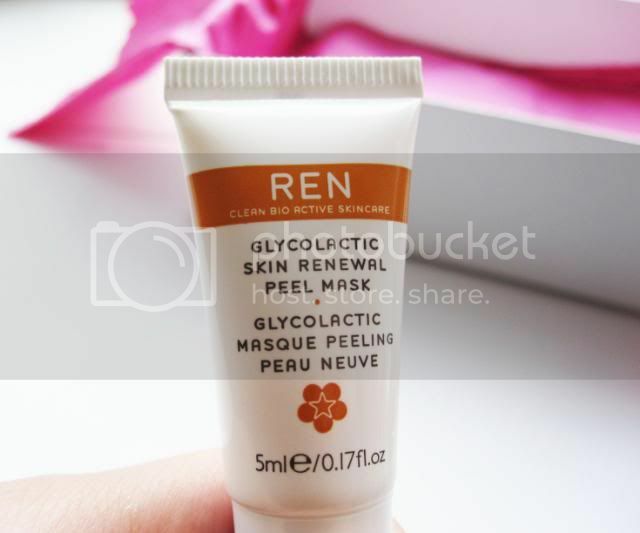 (3) REN Glycolactic Skin Renewal Peel Mask, 5ml sample tube (full size 50ml - £28) - "a potent bio active peel mask designed to renew the complexion, reduce the appearance of fine lines and dramatically improve skin tone." I've seen REN featured in magazines before, they've won various awards for their 'clean bio active skincare' products, so I'm interested to try this out. 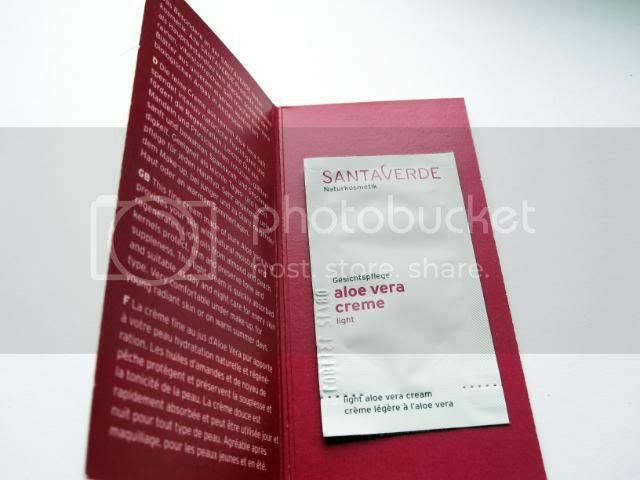 (4) Santaverde Aloe Vera Cream, 2ml sachet (full size 30ml - £28) - "made of pure aloe vera juice, almond and peach oils, which provides your skin with natural moisture. Quickly absorbed and suitable for all skin types." Santaverde are a German brand which my mum uses a lot of, so I'll be sure to give this a go. 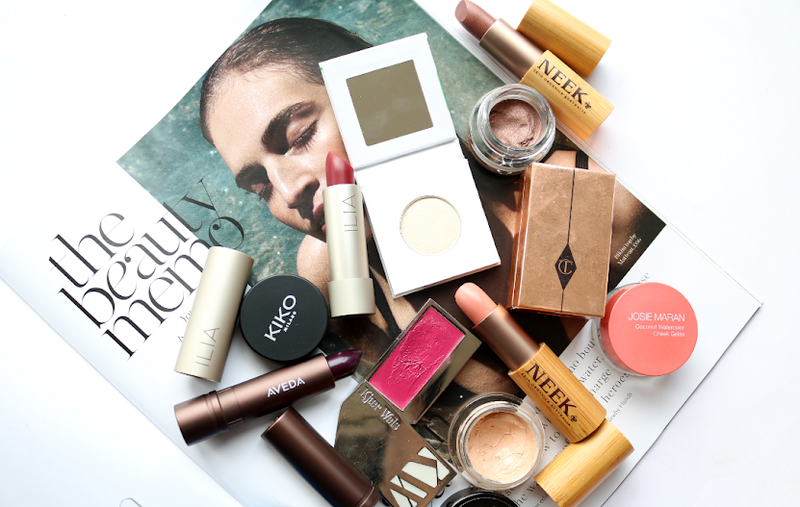 Summary: The Amarya box doesn't go in for fads or hype like some of the other beauty boxes do. It's a very simple concept to promote natural and organic products. It won't appeal to everyone, but for those who do prefer to know exactly what ingredients are in their skincare, don't like animal testing etc, then it will be an absolutely perfect way to try out products which are typically very expensive (I'm happy to pay extra for amazing organic products but I want to know that they will work for me first!). Past boxes have contained make-up items, so I would love to see more included in future boxes as I know that they work with brands like Zoya, Inika etc. With so many mainstream perfume brands being packed full of chemicals, I expect that there will be none of those in these boxes (fingers crossed! ), and that if they do include perfume, then it might be something that I actually like or at least wouldn't mind trying. My only gripe with Amarya is that I'm disappointed with the fact that they include sachets. I don't think you can properly try out a product unless you're given a couple of them and you can't recycle the packaging afterwards. Other than that, I can imagine myself being a long term subscriber to Amarya, and it will be something that organic and natural consumers across the UK will be quietly applauding. This box seems interesting, havent heard about it before. I got the weleda oil in my glossybox, really love it! Think i'll see what the next few of these boxes are like and then try it out! wow, the box seems really good! Following you now, hope you'll stop by my blog sometime and follow me back if you want! We're like the opposite, haha! I haven't subscribed to any beauty boxes. It sure must be exciting receiving so many new products to try out every month, though! 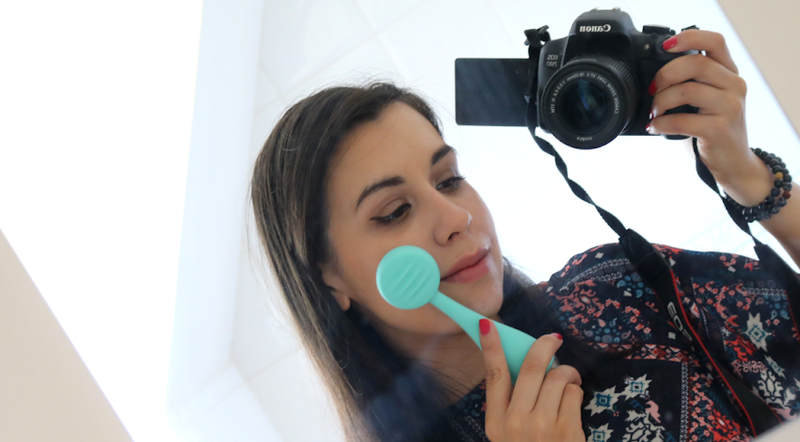 @Zoe - Cool, I can't wait to try it out properly, it smells really good! 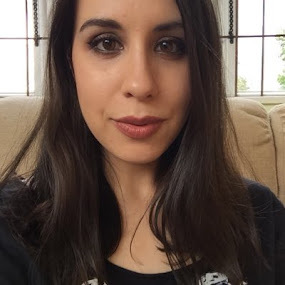 @Beauty Balm - Let me know what you think of the products included when you get yours! 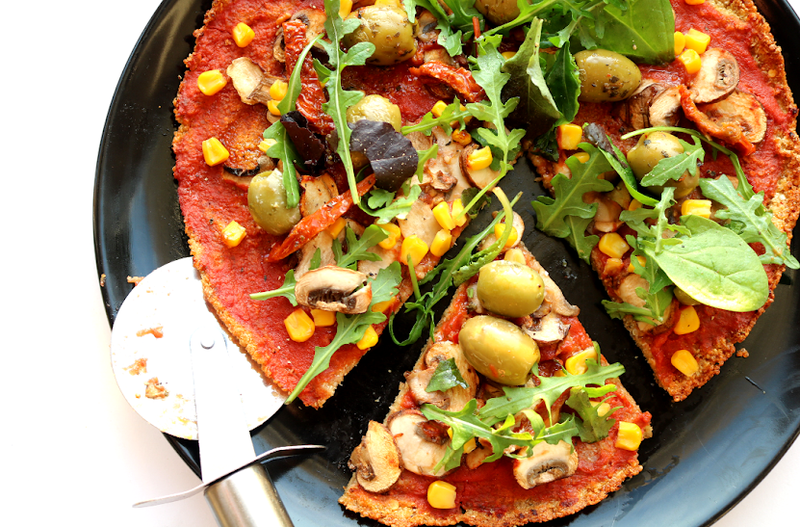 @Michelle - It's super addictive but I'm sure your bank balance is much healthier than mine!